The Federation starship USS Voyager, chasing a band of Maquis rebels, enters the dangerous space nebula known as the Badlands. Both ships are transported by a distant space probe to the Delta Quadrant, 75,000 light-years from Federation space. 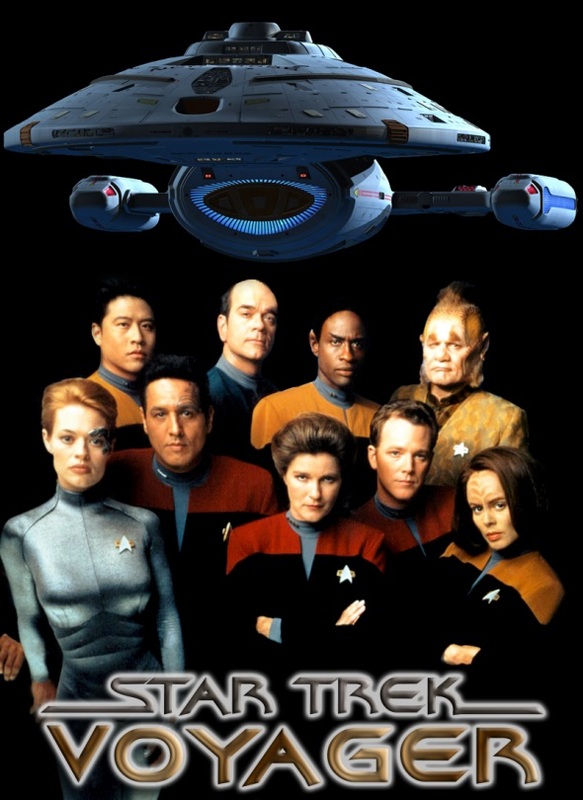 Voyager's crew and the Maquis form an uneasy truce to rescue crewmen of both ships, kidnapped by the probe's builder, the powerful, dying Caretaker. The Maquis ship is destroyed in a battle with the warlike Kazons. To prevent a Kazon aggression against a helpless world, Voyager destroys the space probe. Without the probe, it will take 75 years for Voyager to travel back to Federation space. With the differences between them rendered meaningless by time and distance, The Federation and Maquis crews unite aboard Voyager. Together, they embark on their new mission: to boldly go - home. Pulled to the far side of the galaxy, where the Federation is seventy-five years away at maximum warp speed, a Starfleet ship must cooperate with Maquis rebels to find a way home. It's much different than the others that carry the Star Trek name. I especially enjoy the uniqueness of Capt. Janeway, compared to the the other MALE captains. Of course, we can't forget Seven, who has added spice to the show ever since her first appearance. This show will continue to keep my interest just because of their main mission to get back to Earth. I love this show, I never miss an episode if at all possible and incapable of holding a conversation while it is on (well while Chakotay is on screen, talking or being talked about... what can I say I'm obsessive). I understand why my friends don't think this show is as good as some of the others out there but it's not terrible. The characters are just way too cerebral.. and far too serious all the time. Janeway should let her hair down (if she still had hair), why did they give her a first officer like Chakotay if she's not going to use him! The desire to get home is one that I think everyone understands and it makes the show interesting to watch. You never know how far the characters will go to shave a few more years off the journey and I am almost always surprised at how the "rules" are broken to suit each characters needs. They just need to have more fun, get drunk, party like it's 2455 and figure out that "home" is a subjective term! Voyager's nacelles were created in response to the discovery made in Episode 7.09 of Star Trek: The Next Generation "Force of Nature" that warp travel was damaging subspace. While never mentioned explicitly on Star Trek: Voyager, those who have worked on the show have stated that Voyager's variable geometry warp nacelles were not damaging to subspace. Despite this, the issue brought up in "Force of Nature" was ignored in Star Trek and essentially forgotten as it was seen to have been a limiting issue not conducive to the creation of good stories, specially in Star Trek: Deep Space Nine where ships were frequently seen cruising at over the warp limit enacted in "Force of Nature". A non-canonical explanation of how existing ships were allowed to travel past the warp limit without using variable geometry nacelles may be that Starfleet engineers simply found a simpler way of making warp speed subspace-friendly without changing the nacelles drastically. Besides - it LOOKS so damn cool! Yes, and it's all about the ranks of certain characters. From the beginning Tuvok was apparently meant to be a Lieutenant, but in the pilot episode "Caretaker" was given the rank pips of Lieutenant Commander - two silver, one black. This was allegedly a wardrobe error. Cashiered former Starfleet officer Tom Paris was given the rank of full Lieutenant (two silver pips) and Maquis crewmember B'Elanna Torres was given the rank of Lieutenant Junior Grade - one black strip, one silver on her rank pin. She was seemingly promoted to Lieutenant Full Grade at the end of the following episode, "Parallax", when she is made Chief Engineer (two silver strips on her rank pin). However, during the 12th episode of the first season, "Cathexis", the mistake with Tuvok's rank was spotted and corrected. At the same time it was also evidently decided to "demote" Paris and Torres, both to Lieutenant Junior Grade. This was probably done to maintain a reasonable chain of command, and possibly because it was felt they should not hold the same rank as one of Captain Janeway's trusted and most senior officers. As a result there are several continuity errors as Tuvok and Paris' ranks change back and forth due to the shooting schedule; they retain their original ranks for the sequences set on the bridge, but the revised ones are shown in all other scenes. Torres' rank pin is revised in all her scenes, again a result of the shooting schedule. From a story point of view, it has been inferred that Tuvok and Torres are both demoted as a result of their actions in the previous episode, "Prime Factors", where they undermine Captain Janeway's authority and are summarily disciplined, though any demotions are never seen or referred to onscreen. While plausible, this theory does not account for the continuity errors in the following episode or the change in Paris' rank, though. In the fourth season episode "Revulsion", Tuvok receives an on-screen promotion to Lieutenant Commander, with no reference to any demotion. And to confuse the issue further, in another season four episode, "Day of Honor", Paris takes the time to remind Torres that he actually outranks her, despite the pair seemingly having the same rank! This is because he had served longer on Voyager (even thought it was just by a few days) giving him Time in Service and Time in Grade seniority. During the USS Voyager's return to Earth, the ships lost around 15 shuttles. It was never explained or shown to us in the show how the Voyager crew were able to constantly create new shuttles despite being a medium sized ship thousands of lightyears from Federation space. It can be assumed that the crew replicated shuttle parts and constructed a new shuttle once one had been destroyed. This is one aspect of Star Trek: Voyager which has attracted a lot of negative attention many from fans who feel it was unrealistic for crew to be able to constantly replace shuttles/construct warp drives in their situation. Voyager originally had a complement of 40 torpedoes and Tuvok mentioned in Season 1 Episode "The Cloud" that there was no way to replace them once they were gone. By the end of the ship's seven year journey, Voyager had used 93 Starfleet standard photon torpedoes. The audience is never told or shown how Voyager was suddenly able to replace these supposedly "irreplaceable" torpedoes. However, it is possible that they obtained them through encounters with other species, both friendly (e.g. trade) and hostile (e.g. salvaged from wreckage after being forced into battle). Remember that the crew also obtained several forms of propulsion and defensive technology during the course of the series (the Borg seemed to be an exceptionally rich source for such things), so it isn't completely unrealistic to assume they got a hold of weapons they could modify for their own use. Or, being isolated from Starfleet, the crew just had to become creative in everything, and use the ship for purposes it wasn't originally designed for. Just as they had to regularly create dilithium for their engines, create a Stellar Cartography section, and started a Hydroponics bay and kitchen for growing and cooking food, they may have learned to create torpedoes from the raw materials. According to the numbers stated in the FAQ above, the crew also had to replace several shuttles with active warp drives, so reproducing topedoes would not be too far-fetched. Throughout Voyager's seven year journey, the crew count appears to go up and down several times without any apparent reason why. In season 2 episode 1 "The 37s", it is mentioned there are 152 crew members on board. In season 3 episode 2 "Distant Origin", alien sensors pick up 147 lifesigns. In season 5 episode 4 "In the Flesh", the Doctor implies there are 127 crew members. In season 5 episode 13 "Gravity", it is said there are 152 crew members. In season 5 episode 15 "Dark Frontier", there are 143 lifesigns detected on Voyager. In season 5 episode 22 "Someone to Watch Over Me", there are 146 crew members. In season 7 episode 20 "Author, Author", there are still 146 crew members despite there being several deaths since the events of "Someone to Watch Over Me". Over the years, we saw that Voyager lost approximately 33 crew members. However this was not reflected in the crew counts we heard throughout the show, and an inshow explanation for how the crew numbers jumped up and down so much seems impossible as besides Kes, Neelix, Naomi, Seven and Icheb and the 5 Equinox crewmembers added in Season 6 Episode 1 "Equinox Part 2", there were no permanent new additions to the crew throughout the show. It is far more likely that the writers simply did not keep tabs on the number of crewmembers. This is also reflected in other ways such as the surprise sighting of a female Vulcan on board Voyager in season 7 episode 4 "Repression" which directly contradicts the events of Season 3 episode "Blood Fever" and Season 5 episode "Counterpoint". Yet in the Season 3 episode "Flashback" Tuvok does clearly mention there are indeed other Vulcan crew members aboard Voyager. Due to the nature of the shows premise being that the ship is small and far away from Federation space, such continuity errors are particularly jarring. It takes place in the years 2371-2378 A.D.